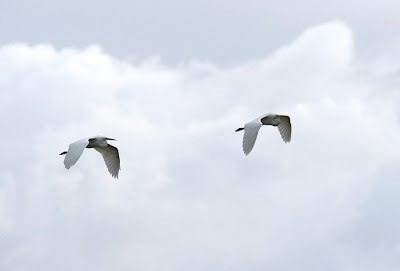 Birding Corvo 2009: Crazy winds! Nice weather in the morning, calm and sunny = passerine search. Crap weather in the afternoon and evening, really windy and a few showers = seawatching. 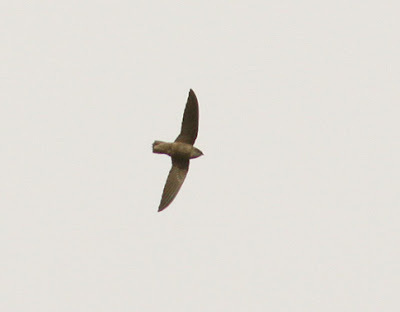 Also saw the Chimney Swift hunting over around Poso de Agua and Fojo during the first half of the day. Birded Fojo below the lower road and after some pisching I heard a very sharp and loud "ZIPP!" close to me. 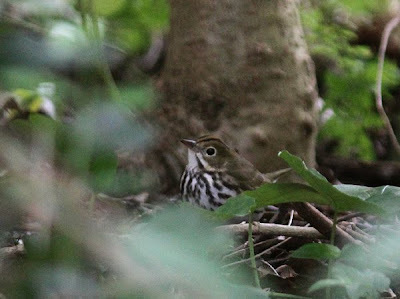 Out from a bush popped an Ovenbird, at the exact same place where Rafa found it a few weeks ago! Probably the same bird that has spent some time in Fojo during the last two weeks and that now has found its way back to its first home on Corvo, or...? Ended the day at the windmill with some seawatching that produced a Gannet and some Great Shearwaters. Tried to string a Manx for a while but it turned out to "just" be a Great. 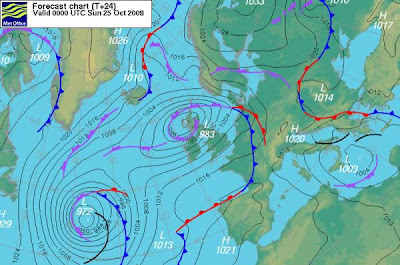 Tomorrow we are getting a new hit from a pretty deep low pressure (see below). Hope it isn't to windy for birding just... the waves are supposed to be about 9 m high! More slip'n'slides for the people!